This silky smooth savoury steamed eggs dish is so easy to make. It goes really well with steamed rice. 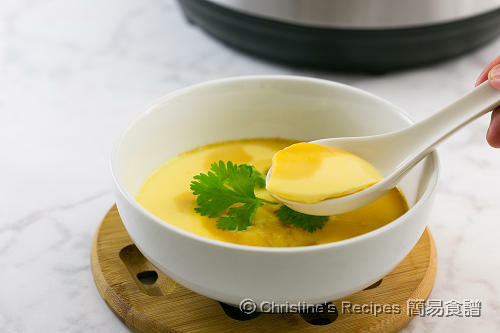 Steamed egg is a very popular dish in Hong Kong cooking. It’s simple and nourishing. We love its silky smooth texture and savory taste that goes really well with steamed rice. Armed with my Instant Pot, an electronic programmed pressure cooker, I don’t need to worry about the timing and temperature. Simply press the buttons and leave it on the bench doing the job for me. I can be very confident to get the exactly same result every time, watching my family enjoying the silky smooth steamed eggs. In the video below, you'll see how easy to make this dish. When it comes to making steamed eggs, you don’t need to weight the eggs. 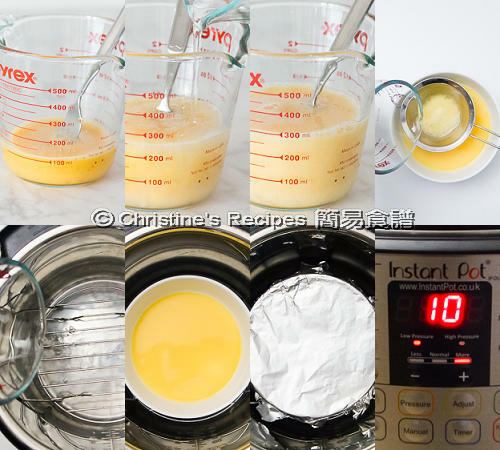 Just use a measuring cup to beat the eggs and water. Needless to say, the ratio of eggs and water used is quite crucial as it controls the texture of the end product. Remember to cover it with foil while steaming. Keep these few things in mind. 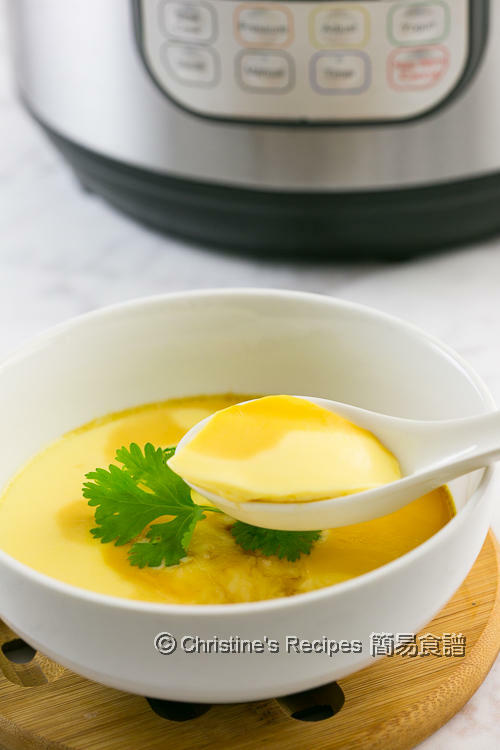 Your steamed eggs will look as perfectly smooth as it should be. Whisk the eggs with the 200 ml of water. Sift through a sieve to remove the foams. Or use a spoon to remove them. Pour in a 15-cm / 6-cm porcelain bowl or a dish. Prepare your Instant Pot: Put in a trivet. Pour in the 1 cup of water. Place the bowl of whisked eggs on the trivet. Cover with foil. Close the lid. Turn the steam release handle to “sealing” position. Press the “steam” button, low pressure cooking for 10 minutes. Natural release for 10 minutes. Press the “cancel” button. Turn the handle to “venting” position. Once the valve drops, open the lid. Carefully remove the seamed eggs from the pot. Garnish with coriander. Drizzle some light soy sauce to taste. Serve immediately. I used large eggs. Don’t need to weight them. Simply use a measuring cup. The ratio of egg and water I used is 1:2. Make sure not to beat the eggs too vigorously. Otherwise too many air bubbles will be formed. I used a porcelain bowl because it can help keep warm for longer time. Used to have this for the lunch very often...didn't it would work with instant pot though. Can't wait to give it a try! Thanks for sharing, Christine. Looks wonderful and reminds me of the steamed eggs my mother always made when I was sick. May I ask what you are using in the video to get the bowl out of your instant pot? It looks very practical and I'd love to get one of those. Oh, this dish means so much to you then. I used foldable dish plate clip tong to get the bowl out from my Instant Pot. As the bowl is very hot, the clip tong can prevent my hand from burning. You can get one from Amazon here. Or you can get one from any Asian grocers. Thank you for your fast reply, I will definitely buy one of those clip tongs. wonderful! I got Instant pot, too. will try it out. That's the dish I grew up with. My favourite too. I put the recipe in my cookbook already. Many thanks for sharing your wonderful recipes. If I cook 6 large eggs, how long should I cook them in the pressure cooker? Should I use your timing X 3, i.e. for 30 minutes? Once again thanks for your generosity in sharing your recipes. If using 6 large eggs, I don't recommend you to use only one deep bowl as the largest diameter of your bowl to be used in Instant Pot is around 6 to 7 inches. You might try to cook it in two separate bowls layering in two tiers, just like the way I made radish cake (recipe on this blog). The cooking time won't be too long. I didn't experiment with this large amount, 6 large eggs. So I can't tell you an exact cooking time. But sure that you don't need to triple the cooking time. Just add two or a few minutes. Let me know how you go if you do the experiment. Thank you so much for teaching and sharing, Christine! I could never make it this silky with regular cooking on the stove, now can easily achieve with your recipe and instant pot! Reminds me of my grandfather, he used to make this just as silky when I was a child. Thank you! Hi Christine, thank you so much for sharing your wonderful recipes! 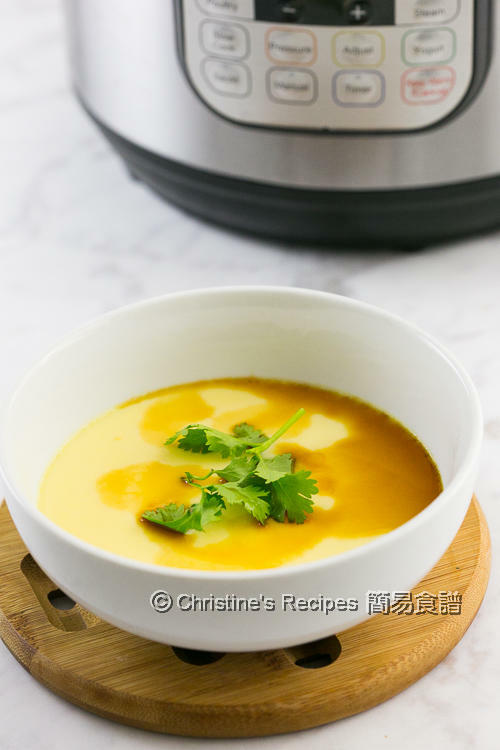 Could you please add instructions for making the steamed eggs in a regular pot on the stove (i.e. no pressure cooker/Instant Pot)? Thank you so much! I've got a recipe for steaming eggs on stove. Please check it out. Thank you so much for this IP version recipe. The most perfect and easy way to steam egg. It makes my 5 yr old girl very happy. Is a must every week for her now. I just got a IP and still learning. Please post more Asian food using IP. Thanks for all your wonderful recipe Christine! Glad to know that your girl liked it. I love my IP too. Will post more IP recipes for sure.